^ a b Hopkins, Daniel J.; Staff, Merriam-Webster; 편집부 (2001). Merriam-Webster's Geographical Dictionary. p. 46. ISBN 0 87779 546 0. Retrieved 18 May 2001. ^ Khatchadourian, Lori (2011-09-05). "The Iron Age in Eastern Anatolia". The Oxford Handbook of Ancient Anatolia. 1. doi:10.1093/oxfordhb/9780195376142.013.0020. Retrieved 2018-12-05. ^ Philipp Niewohner (17 March 2017). 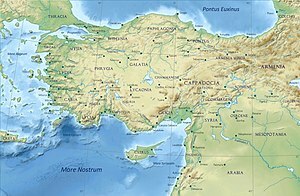 The Archaeology of Byzantine Anatolia: From the End of Late Antiquity until the Coming of the Turks. Oxford University Press. pp. 18–. ISBN 978-0-19-061047-0. ^ a b Khatchadourian, Lori (2011-09-05). "The Iron Age in Eastern Anatolia". The Oxford Handbook of Ancient Anatolia. 1. doi:10.1093/oxfordhb/9780195376142.013.0020. Retrieved 2018-05-06. ^ Palumbi, Giulio (2011-09-05). 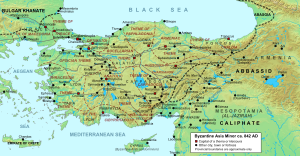 "The Chalcolithic of Eastern Anatolia". The Oxford Handbook of Ancient Anatolia. 1. doi:10.1093/oxfordhb/9780195376142.013.0009. Retrieved 2018-05-06. ^ Everett-Heath, John (2018-09-20). "Anatolia". The Concise Dictionary of World Place-Names. 1. Oxford University Press. doi:10.1093/acref/9780191866326.001.0001. ISBN 978-0-19-186632-6. Retrieved 2018-12-05. ^ Suny, Ronald Grigor (2015-03-22). "They Can Live in the Desert but Nowhere Else": A History of the Armenian Genocide. Princeton University Press. p. 31. ISBN 978-1-4008-6558-1. ^ "Çatalhöyük added to UNESCO World Heritage List". Global Heritage Fund. 3 July 2012. Archived from the original on January 17, 2013. Retrieved 9 February 2013. ^ a b Yavuz, Mehmet Fatih (2010). "Anatolia". 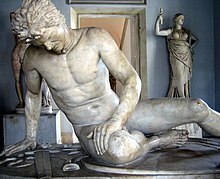 The Oxford Encyclopedia of Ancient Greece and Rome. Oxford University Press. doi:10.1093/acref/9780195170726.001.0001. ISBN 978-0-19-517072-6. Retrieved 2018-12-05. ^ Thonemann, Peter ThonemannPeter (2018-03-22). "Anatolia". The Oxford Dictionary of Late Antiquity. 1. Oxford University Press. doi:10.1093/acref/9780198662778.001.0001. ISBN 978-0-19-866277-8. Retrieved 2018-12-06. ^ "Osman I | Ottoman sultan". Encyclopedia Britannica. Retrieved 2018-04-23. ^ "Orhan | Ottoman sultan". Encyclopedia Britannica. Retrieved 2018-04-23. ^ Fleet, Kate (2010). "The rise of the Ottomans". The rise of the Ottomans (Chapter 11) - The New Cambridge History of Islam. Cambridge Core. pp. 313–331. doi:10.1017/CHOL9780521839570.013. ISBN 9781139056151. Retrieved 2018-04-23. ^ Finkel, Caroline (2007). Osman's Dream: The History of the Ottoman Empire. Basic Books. p. 5. ISBN 978-0-465-00850-6. Retrieved 6 June 2013. ^ electricpulp.com. "HALICARNASSUS – Encyclopaedia Iranica". www.iranicaonline.org. Retrieved 2018-04-23. ^ Cemen, Ibrahim; Yilmaz, Yucel (2017-03-03). Active Global Seismology: Neotectonics and Earthquake Potential of the Eastern Mediterranean Region. John Wiley & Sons. ISBN 978-1-118-94501-8.